As of Monday, July 16 total oil product stocks in Fujairah stood at 20.111 million barrels. Total stocks rose by 6.3% week on week and topped the 20 million barrel level for only the second time this year. Stocks of light distillates jumped by 19.9% week on week to 7.322 million barrels. Gasoline markets are weak in Asia due to ample supply, but stronger in Europe due to tightness in the Mediterranean and cross-Atlantic pull from the US summer demand. 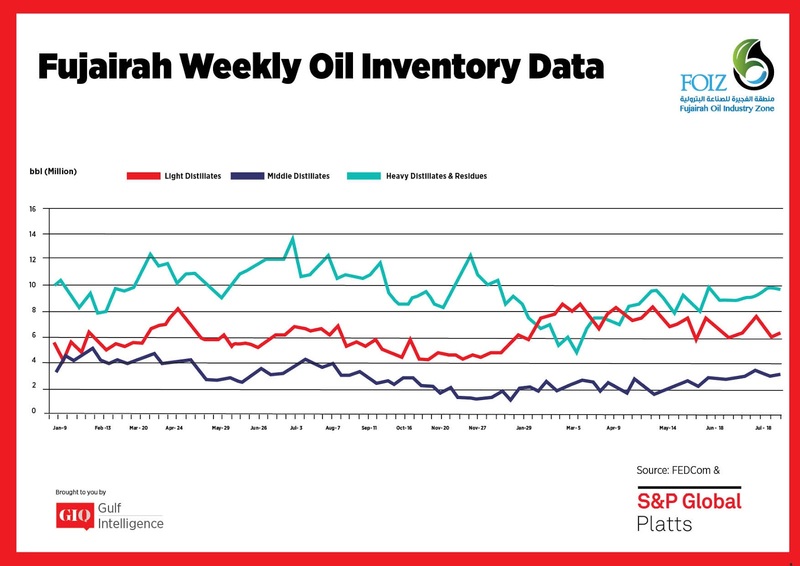 Demand in the Middle East seen as steady and the region could see additional barrels from the East rather than the West. In tenders, Kuwait’s KPC was seeking a total of 75,000 mt of RON 91 and RON 95 gasoline for delivery between August and October. Spot premiums for Arab Gulf RON 95 gasoline rose to a seven-month high of $3.95/b yesterday. Stocks of middle distillates rose by 3.2% week on week to 3.01 million barrels. The gasoil market remains soft in the East of Suez amidst weak demand and limited arbitrage pull. The front-month East-West Exchange of Futures for Swap was priced at minus $6.80/mt yesterday – which is above the levels of minus $10-15/mt needed to make gasoil arbitrage workable. Similarly, cross-regional flows of jet fuel remained robust in recent weeks, but several sources noted that arbitrage activity from Asia and the Middle East to the ARA region has started to slow amid eroding economics and high clean tanker rates from the East to the West. Stocks of heavy distillates and residues fell by 1.2 % week on week to 9.779 million barrels. 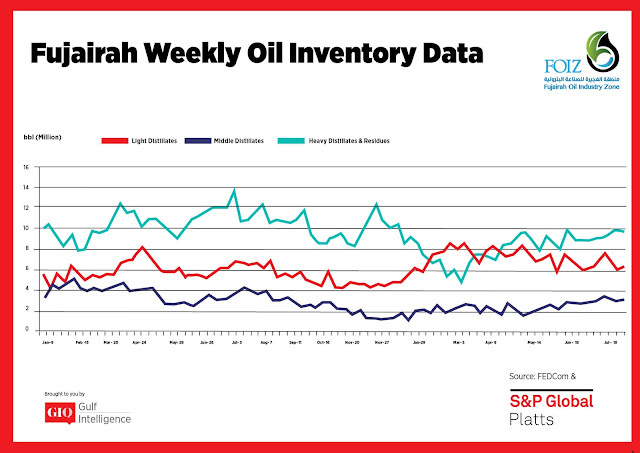 Stock levels fell back from the seven month high seen last week; the last time heavy stocks topped 10 million barrels was December 25, 2017. Bunker demand in Fujairah was reported as positive yesterday as prices tumbled in line with the sharp dip in crude prices. 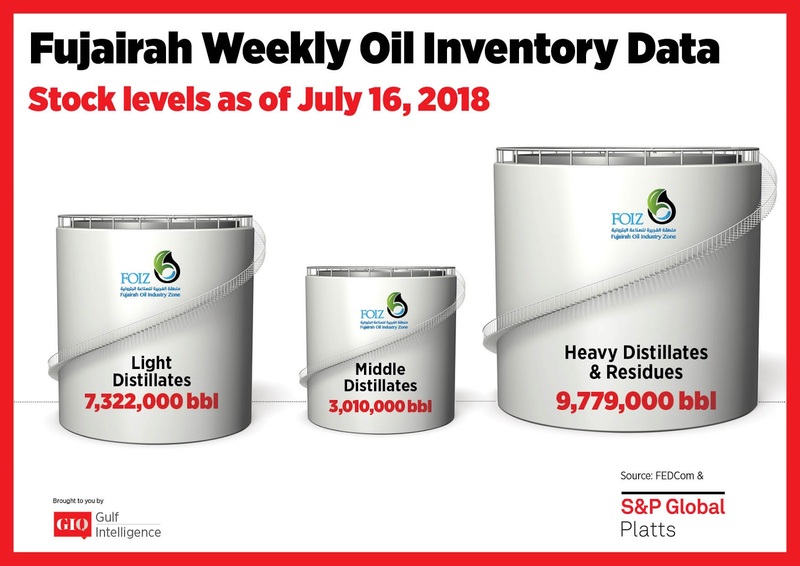 "Demand did strengthen but it's very hard to price due to Brent falling," a Fujairah-based bunker fuel trader said. Front-month time spreads for Arab Gulf 180 CST swaps strengthened to $6/mt yesterday on a continued tight outlook for the Singapore market.